2015 Volkswagen Golf / GTI Pros and Cons: Why (Not) This Car? When an American or Asian auto maker redesigns its cars, far more often than not the new one looks radically different from its predecessor. This is less common with some German auto makers. The latest Volkswagen Golf, the seventh, strongly resembles the first, which arrived in North America 40 years ago as the Rabbit. Appearances can be deceiving. Though VW has retained the Golf's overall appearance and basic, trendsetting configuration for four decades, major changes have occurred beneath the skin. The 2015 Golf rides on an all-new "MQB" platform. This platform is so flexible that it will eventually provide the basis for dozens of models worldwide. Furthermore, these can employ just about any powertrain: gas, diesel, CNG, plug-in hybrid (as in the upcoming Audi A3 e-tron), or electric (as in the new e-Golf). This flexibility would be of little benefit if the resulting cars weren't good ones. The first example, the 2015 Audi A3, is better than the Mercedes CLA in just about every way. But the Audi starts over $30,000 and can end up much higher with options. How many corners must be cut so that the Golf (in two-door form, at least) can start under $19,000? I recently had the opportunity to drive the new Golf in e, TDI, and GTI forms. The short answer: not many corners. For the long answer, read on. A quick note: I'll compare the new car primarily to the Focus ST because no one else offers a diesel hatchback and I haven't driven the e-Golf's closest competitor, the Focus Electric. I'll slip in a few words on the TDI and e-Golf anyway. Also, if I was buying a car myself it probably would be the GTI or Focus ST--they're great combinations of practicality and performance. Update: I later had a GTI and an e-Golf for a week each. I edited this review to reflect my impressions of the former, and have added a review of the latter. Black leather is more upscale (and feels more upscale than it looks) but plaid cloth is more fun. Why the 2015 Volkswagen Golf / GTI? Materials in the new Golf are nearly as good as those in the considerably pricier A3. The Volkswagen's instrument panel arguably appears more upscale than that in the Audi. The car oozes quality and solidity. The Focus also compares well here--to every competitor save the new Golf. As good as the new Mazda3 is, it and other Asian cars simply don't feel as substantial as the Golf or the Focus. Volkswagen claims to have upgraded the Jetta to the same level as the new Golf, but drive the cars back-to-back and the difference still approaches night and day. The designed-for-America sedan feels less solid and less composed, and its interior seems cheaper. Even the new Golf has some bits in need of further improvement: the climate control knobs continue to feel chintzy. That's about all, though. Which handles best, the new Volkswagen GTI or the Ford Focus ST? This might depend on whether the measurement is objective or subjective. Technically, the GTI (and even the regular Golf) handles very, very well, with a lighter, tighter, and more precise feel than its predecessor. Whether on a winding road or a track, the new GTI serves as an exemplar of stability, its chassis poised and solid, its steering precise and linear--all that good stuff. Plus, thanks to some electronic chassis trickery, it feels much more balanced than its predecessor, and than any car this nose-heavy has a right to. But more fun might be possible in the Focus ST. The ultra-refined Volkwagen exudes a quiet competence, maintaining the same attitude of barely there understeer no matter what you or the road do, its talents in reserve until they are truly required. In contrast, the Ford can hardly contain a puppyish eagerness to attack the road, any road. Its steering and suspension react more quickly, more sharply, and more dramatically. Want to rotate the car into a curve? Lift off the throttle at corner entry and enjoy a controlled dab of oversteer courtesy of the brake-based torque vectoring system. Intially, I found Ford's GTI-on-meth much more entertaining. But the more I drove the GTI, the more I enjoyed it. Driving the cars back-to-back, I was surprised to find how much more easily and smoothly I could hustle the GTI; I'd previously thought the Focus ST the champ in this regard. Both cars can make you seem a better driver, but the VW truly shines here. You might still prefer the Focus ST's more exuberant personality--until you just want a relaxing commute. Then you'll wish you were driving the less frenetic GTI, which rides somewhat more smoothly. Unlike the regular Golf's steering, the GTI's has two modes. Finding "normal" far too light, I could easily live with "sport" as the only mode. But, in a DSG car, I wouldn't want to live with the transmission in sport mode, as gear choices that make sense when hustling make much less sense in typical driving. Kudos to VW for also including a mode where the systems can be set independently. I liked the steering in the regular Golf at least as much as the fancier system in the GTI. Given the regular Golf's more pedestrian mission, I was thoroughly impressed by its handling. The Focus and Mazda3 also handle very well, but the new Golf has the most unflappable, unerringly precise chassis of the bunch. The new GTI is available with a limited-slip front differential (as part of a $1,495 package that also includes ten more horsepower and upgraded brakes) and adaptive dampers ($800). I haven't sampled the latter. The former improves traction out of turns (already good for a FWD car) without adding any odd twitchiness to the steering (an issue with the similarly equipped Honda Civic Si and Subaru WRX STI). You want it. The new GTI looks especially athletic from the rear quarter. GTI gets sportier flat-bottomed steering wheel. Controls generally easy to reach and operate. Diesels excel at the sort of midrange grunt that makes for effortless daily driving. VW's latest four-cylinder TDI, with 150 horsepower (ten more than before, 20 below the new gas 1.8T) and 236 pound-feet of torque (37 more than the gas 1.8T), easily motivates the new Golf. Typical of the breed, the diesel can be a little slower to initially respond to your right foot, but then pulls smoothly and strongly. Except when idling, and nearly then as well, noise and vibration are nearly low enough to make one forget the engine is a diesel (unlike in the Chevrolet Cruze). For lightning quick initial responses, check out the new e-Golf. The electric motor, with 115 horsepower and 199 pound-feet of torque, isn't as strong as those in the Chevrolet Volt (149 horsepower, 273 lb-ft) or Ford Focus Electric (143 horsepower, 184 lb-ft), but in typical driving it feels easily sufficient. Lke all electrics it responds to power requests instantly, with an eerie near-silence. Of course, drivers seeking the quickest Golf will opt for the GTI (at least until the new 290-horsepower Golf R arrives). On paper, peak power of the new (but still 2.0-liter) engine only increases modestly, from 200 to 210 (or 220 with the $1,495 Performance Package). But midrange power, as indicated by the peak torque figure, 258 vs. 207 pound-feet, is up considerably more. Fully unleash the new engine, and the GTI accelerates rapidly, if with fewer visceral thrills than the rortier Focus ST. Even without the optional limited-slip differential the new GTI pulls out of corner exits with only a hint of wheelspin, its electronics managing slip better than those in most front-wheel-drive cars (the Focus ST excepted). With the manual transmission, the shifter feels smoother and more precise than in past GTIs, but it's still not as satisfying to snick between gears as the best (i.e. the shifters in the Honda Civic Si and the Mazda3). The 2.0T engine somehow feels more energetic with the dual-clutch automated manual transmission (DSG, in VW parlance), which swaps ratios far more quickly than a human driver can, eliciting a clipped whoomph from the engine as it does so. With either transmission the 2.0T engine has the somewhat dieselish voice of a twin-scroll turbocharged four. I didn't mind hearing it, but I didn't rev the engine just to listen to it, either. I've put fuel economy in the "why to buys" largely because of the TDI and e-Golf. The former delivers an unbeatable (for the price) combination of driving enjoyment and fuel efficiency. The EPA ratings, which tend to over-estimate diesels' real-world fuel economy, are up a smidge with the new engine, to 31 mpg city, 43 mpg highway. I managed mid-40s in suburban driving with the old engine. The e-Golf similarly vies with the Focus Electric (which I haven't driven) for the title of the most fun-to-drive sub-$50k electric car. A Leaf might be more energy efficient--the EPA hasn't yet released ratings for the VW (which claims a range of up to 118 miles). But the Nissan feels far less substantial and isn't nearly as satisfying to drive. Prefer to stick with gas? Ditching the old 2.5-liter five-cylinder engine in favor of a new turbocharged 1.8-liter four-cylinder (but retaining a six-speed conventional automatic) bumps the Golf's EPA ratings from 24 mpg city, 31 mpg highway to a much more competitive 26 and 36, respectively. Though not best in class, they're close enough given the boosted engine's plump powerband. A 184-horsepower Mazda3 s barely outpoints it, with 27/37. Prefer a manual, even though one is only offered in the base trim Golf? Then the Golf's highway rating gets bumped one mpg, while the Mazda's ratings sink to 26/35. Or maybe you're willing to trade fuel economy for the GTI's additional thrust. Surprise: you won't have to trade away much. The 2015 GTI scores better in the EPA's tests than the 2014 did. With the DSG, the numbers improve from 24/32 to 25/33. Not much of an improvement? Well, the old car's figures with the DSG were already pretty good. Those with the manual were much more in need of improvement, and significantly improve they have, from 21/31 to 25/34. The new stick-shifted GTI's scores nearly match those of the much less powerful Mazda and meaningfully exceed the Focus ST's 23/32. During my week with a manual transmission Performanced-Packaged GTI, the trip computer regularly reported suburban averages around 30 mpg, with a high on my standard home-to-school route of 36. On the highway, it actually averaged over 40 mpg at 65 mph, where the engine is spinning only 2,000 rpm, but "only" about 36 mpg when driven on a 70-mph highway. Very impressive for such a quick car. With each complete redesign the Golf has gotten larger, and the new one is the largest yet. In two dimensions, anyway. The new car is a couple inches longer (167.5 vs. 165.4), and a half-inch wider (70.8 vs. 70.3), but an inch lower (57.2 vs. 58.3). Inside, this translates to an extra inch of shoulder room (55.9 vs. 54.7) but about the same amount of legroom and a bit less headroom. Frankly, the official specs can conceal as much as they reveal. All too often they don't seem to accurately reflect reality. Also, how the interior is designed can make it feel much more--or much less--roomy than the specs suggest it actually is. And the driver seat itself? Comfortable and supportive in the GTI, without being constraining (a complaint some have with the Focus ST's optional Recaros). The regular buckets in the regular Golf have smaller bolsters, but they are actually more form-fitting, at least with my personal form. Americans tend to think of C-segment compacts like the Golf and Focus as too tight for family use, but these are family cars in Europe. Reflecting this mission, the new Golf's rear seat is roomy and comfortable enough for adults. A few in the segment, including that in VW's own Jetta sedan, have more legroom. But most, including those in the Focus ST and Mazda3, are significantly tighter. The two-door Golf's rear seat, though more difficult to access than the four-door's, is equally roomy once accessed. There's considerably less rear legroom in the Focus, but its rear seat cushion is higher off the floor, and so more comfortable for those of us not tall enough to need the Volkswagen's additional space. Why Not the 2015 Volkswagen Golf / GTI? I'm coming up short on reasons not to buy the new Golf. Sure, Volkswagens don't have the best reputations for reliability, but the horror stories generally involve those from the early 2000s, manufactured over a decade ago. In our stats more recent VWs tend to hold up reasonably well for the first four to six years, and the 2012s and 2013s have been quite reliable, at least so far. Will the all-new 2015s further improve on the 2012-2014 cars, or will there be some first-year glitches? We'll likely have our first fairly precise reliability stats for the new Golf and GTI in February 2015. For now, they're a bit of a gamble. Update: Our earliest data suggests that the new GTI has had a glitch-free launch. But it's early, so stay tuned for quarterly updates from February 2015 onwards. Aside from unknown reliability, the only "why not" I can come up with is feature availability. Volkswagen doesn't offer its fanciest gizmos in the new Golf and GTI, at least not on this side of the Atlantic. We get only a basic, small-screened navigation system. You'll have to park the car yourself, it won't do this for you. An option package bundles front and rear obstacle detection with forward collision alert, but you'll have to rely on the mirrors to monitor your blind spots and the windshield to monitor whether you're staying in your lane. On the other side of the ledger, trim levels SE and up are equipped with 400-watt Fender-branded audio systems that excel at bass production. Serious drivers don't care about such electronic frippery anyway. They do care about things like adaptive dampers and a limited-slip differential. In the past VW offered some expensive options like these in Europe, but not in North America, because people here balked at expensive hatchbacks. With the new GTI they're also offering these options in the United States and Canada. Also note that, unlike with the Focus ST, you have the option of two or three pedals with the GTI. And, with the Golf, the option of diesel power. So this isn't much of a "why not." Fascia strakes, perhaps the new GTI's most controversial design element, add some visual interest. More rear seat room than Americans expect in cars this size. Dark with red-stiched black leather. After six updates the latest Golf still strongly resembles the first, which arrived in North America 40 years ago as the Rabbit. Revised proportions--the new car is a couple inches longer, a little wider, and about an inch lower--help make the latest Golf the most attractive one yet. But it's still nothing flashy. There's much more surface drama with the Ford Focus ST. But many people prefer a tastefully restrained classic, and the basic shape of the Golf has managed to remain in-style for four decades. The new Golf's interior styling is similarly tastefully restrained. You'll find much more dramatic interior styling in a Ford, Hyundai, or Mazda. But the more dramatically styled interiors often feel less roomy. And even people who prefer a dramatic exterior often prefer more restraint where they spend hours each week. To liven up the GTI's interior a bit, you can opt for the base model, which has sturdy plaid cloth (a model tradition) rather than red-stiched black leather on the seats. I would. Though not entirely free of jiggle and jostle, the GTI rides more smoothly than the more tightly suspended Focus ST. I personally find the Ford's ride livable, so I'd have no qualms at all with the GTI as a daily driver. Both cars are fairly quiet inside when cruising, but the Ford has the heavier, more insulated feel of a slightly more upscale car. The redesigned Golf can carry more of your stuff. Cargo volume with the second row folded is up from 46.0 cubic feet to 52.7. Figures in the Ford Focus and Mazda3 remain close to that for the old car. Among compact hatchbacks, only the Hyundai Elantra GT comes close, at 51.0 cubes. With the rear seat up, all of these cars have stats in the low 20s. I've found this amount easily sufficient for my family's weekly grocery / Costco run. The extra capacity of a crossover isn't often needed. Thanks to the packaging wizardry of the MQB platform, the e-Golf can carry just as much of your stuff as the regular Golf. A 24.2 kWh battery pack, 50 percent larger than that in the Chevrolet Volt, fits entirely into a double-T-shaped space beneath the center console and the seats. 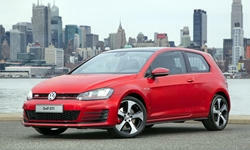 Golfs, and especially GTIs, have tended to be expensive compared to other mainstream compacts. But Volkswagen wants to sell far more cars in North America, so it has added content while holding prices steady, or even cutting them. The 2015 GTI's $25,815 base price is $100 below the 2014's even though the new car includes about $1,000 in additional content, including a newly standard telematics system (e.g. OnStar). This is $1,365 more than a 2014 Ford Focus ST, but virtually all of the difference can be ascribed to the new GTI's higher level of standard content. Upgrade to the GTI Autobahn, and it's $30,415 list price is only $520 more than a Ford Focus ST3 with sunroof, while including about $700 in additional content. For the DSG transmission, add $1,100. For the Performance Package, with a limited-slip differential not offered on the Focus ST, add $1,495. And for the adaptive dampers, also not offered on the Focus ST, add another $800. These two options are not available on the base GTI, but are offered on the SE as well as the Autobahn. Don't want a $35,000 GTI? Don't check all the boxes. VW has cut prices especially aggressively with the TDI. The most affordable four-door Golf diesel now checks in at $22,815, $3,205 less than last year. This is partly because the TDI is now offered with a lower trim level, but so much more is standard this year that the base trim now has nearly as much content as the mid-level trim did last year. Add $1,100 for the DSG transmission. The story is a little different with the gas-powered Golf. A 1.8-liter turbocharged four-cylinder engine has replaced a cheaper-to-produce, equally powerful, but much less efficient 2.5-liter five-cylinder engine. If you need only two doors, a Launch Edition starts at $18,815. The 2015 four-door's $21,515 starting price (with an $1,100 automatic transmission because one was standard last year) is $700 higher than the 2014's, but this is more than canceled out by about $1,650 in additional content. Do the math, and you'll find the the diesel now costs $2,400 more than the gas-powered Golf. People who drive about twice the average, as TDI owners often do, will completely earn back this $2,400 in about six years at current fuel prices. Eventually, but not terribly quickly. But the TDI also will be worth significantly more when the time comes to sell or trade the car. Comparing four-year-old Golfs with 96,000 miles on kbb.com, the TDI is worth over $3,000 more. And the e-Golf? It starts at $36,265 and, like the similarly priced Focus Electric, is eligible for a $7,500 tax credit. It's more expensive than the regular Golf, but not by a crazy amount. A larger impediment: VW will offer the e-Golf only in "ZEV" states (CA, CT, MD, MA, NY, RI, OR, and VT). By objective measures, the redesigned Volkswagen Golf and GTI approach compact hatch perfection. You give up very little compared to the more expensive Audi A3 (reviewed here)--unless you want a more prestigious badge, a sophisticated navigation system, a trunk, or all-wheel-drive. Compared to their predecessors, the 2015s look better, have better-finished interiors, drive with greater precision and solidity while feeling lighter on their feet, go farther on a gallon of fuel (or use no liquid fuel, in the case of the e-Golf), and include more features for the same or less money. The GTI isn't as dynamic or as eager Focus ST--and for this reason I initally preferred the Ford. But after a week with the GTI, and the ability to drive the two back-to-back, my preferences shifted. The Volkswagen is just so easy to drive smoothly. It's ability to make you feel like a pro behind the wheel is almost uncanny. And it proved more fun in typical daily driving than my initial drive led me to expect. ...unless you're more interested in fuel economy than performance. Given my desire for visceral thrills in a performance-oriented car, the new Golf TDI, with its different mission, exceeded my expectations more than the new GTI did. Sure, the TDI is not as quick as the GTI, and it doesn't grip curves as tightly. But the Golf TDI has far more in common with a GTI than it does with a Prius. It performs and handles very well for a car easily capable of over 40 real-world miles-per-gallon, and for a much lower price than the less capable 2014. So, GTI or TDI? Let your priorities decide. New 2.0-liter turbo four is slightly more powerful but much torquier than the old one. And more mpg. The new, slightly longer Golf can carry about 15 percent more stuff than the old one or the Focus. Volkswagen provided airfare, hotel, meals, and insured, fueled cars at an event for invited media. Later they also lent me a GTI for a week. Frank Cianciolo of Avis Ford in Southfield, MI, helpfully provided a Focus ST. He can be reached at 248-226-2555. 2015 Volkswagen Golf / GTI pros and cons, according to Michael Karesh: the best reasons for buying (or not buying) the 2015 Volkswagen Golf / GTI. Join TrueDelta to post your own impressions. The Golf GTI is now made in Mexico. With Volkswagen past quality control and parts and labor costs, this would bother me. In my opinion, a bit of gamble to buy this in year one. Although not a hatchback the new Subaru WRX has a wide trunk opening for a compact four door sedan. I test drove all Mazda 3 and the subaru WRX and I have signed apurchase order for a 2015 WRX premium model. Quicker than either of these two cars with better handling. WRX is a bit more noisy. Glad you found a winner! I'll be testing a WRX later this month. If the car is properly engineered, then Mexicans can assemble it just fine. If it's not properly engineered, then Germans can't assemble it well, either. Plenty of problems with German-made Audis and VWs in the past. In the Introduction section you wrote "I last drove a Nissan Versa a couple years ago, and then only briefly." Yes, yes I did! Fixed. Michael, thanks for the review. The upcoming 2015 golf wagon is on my list as a possible replacement for my 2004 Passat wagon. I'd lean towards 1.8T 5MT model, so wondering if you've had a chance to try this drivertrain? I've driven the Passat a couple times with the 1.8T, once with the manual (review this month if I maintain my newfound momentum). It's a fine all-around engine. Smooth, decent power (if much less than the 2.0T), very good fuel economy. Most people, yes. That's why I limited this statement to "people who drive a lot." But, spurred by your comment, I have taken a closer look at the math. If we assume 33 mpg for the 1.8T and 42 mpg for the 2.0 TDI (both over EPA city but about what I've managed in real-world suburban driving), $3.50/$3.80 for the fuel prices, and 24,000 miles of driving per year (about twice the average), fuel savings would amount to $370/year. So it would take a little over six years to completely earn back that $2,400. In four years about $1,500 of it would be earned back. But I also looked at KBB used car values for 2010 Golfs, and they suggest that a used TDI is worth $4,000 more than a used 2.5, $14420 vs. $10388 (with both in very good condition). Hard to believe that the difference is this large, but it is clearly substantial. I'm going to tweak the wording in the review. Thanks for the nudge! Nice job, Michael. I've been waiting for you to give this platform a try. As a fellow owner of an aging Protege5 I am also shopping replacements, and since your original epinions review helped my purchase of the P5 I've been very curious to see what your next car will be. Is there a GTI or TDI in the future for you? I am also intrigued by the TDI Golf Wagon. Sad news: I sold the Protege5 a few months ago. Because I get these cars to review I'd only driven it about 800 miles in the past year. And I told my father years ago that once he was done with a 2006 RX-8 I'd take it. And he was ready for me to take it. So I now have the RX-8. If I was driving a car daily, I probably wouldn't buy the GTI. It's a really good car, but I'm just not feeling much of an affinity for it. German cars hardly ever feel lively enough to me in typical daily driving. I'd more likely buy a Ford Focus ST, or maybe a Fiesta ST. But a Mazda3 s manual (offered for 2015) might top those--I've asked for one to review. There's also a new MazdaSpeed3 on the way, and it will likely be a fantastic car. Interesting review. I found the new GTI a bit lifeless to drive, with a way too loud (84db measured by C/D) engine soundtrack when goosed, and then it was all midrange with no enthusiasm for high rpm. Supposed to ride the torque wave, I guess. Nor was I impressed with interior room or quality, with the nav screen mounted too low. The interior was exceptionally well assembled from medium quality material, but the driver's sun visor (a 29 cent item, if I ever saw one) buzzed constantly - no amount of pushing, pulling or tapping would quiet it. Grrrr! The 6 MT had vague throws compared to my pal's new cheap spec Mazda 3i, which is literally half the price. Had to fish around for the 5/6 plane on the highway with exactly the same bendy lever and feel under the styling gloss as my '80 Jetta (shudders in remembrance). So DSG for me. The whole car felt a bit lightweight, including the pedals, and the ride was jostly on our awful roads. I even asked what it was like in a crosswind. Now, I'm in Canada, and live on a rural curvy road at the top of a very steep hill, and have had AWD for snow and ice since 1988. So I want the Performance Pack's active limited slip diff. Guess what? Only going to be available as a trim above the Autobahn next spring. Forty thousand dollars. A poverty-spec Audi A3 2.0t with 10 more hp is $36K, so the GTI value just isn't there since I prefer the A3 interior anyway. When I got back in my '08 Legacy GT (your reviews led me to that car back in the day), I found: better, more accurate steering, much less noise, smoother ride, more room, nippier around city corners, and an engine that lunges for 6600 rpm. No contest, since I no longer drive as much since retiring and fuel economy is way down on my priority list. The GTI is merely the latest car I've tried that the LGT has vanquished. Saved up to buy a new car for my retirement, and all I've found is that these new cars are pretty bland. Accord, Mazda6, CLA, ATS (coarse 2.0t and ridiculous price), WRX CVT (no manual available for test drive yet) tonka toy interior, Chrysler 200 AWD (noisy engine, ponderous, frenetic 9 speed), Acura TLX FWD, both 4 and six - all dismissed. But I got an email today that the SH-AWD is in, so I'll drive it this week. The cheap V6 AWD version in Canada (not available in US) is $39,990, same as a loaded GTI! And thankfully deletes the execrable Honda electronics suite for blind spot, radar cruise, etc., but still has that rotten ZF nine speed. A lot of repairs can be done on the LGT which isn't rusty, for a lot less than purchasing one of these underachievers for $30 to $40K. Just my opinion. I initially shared your opinion of the new GTI. But a week with one, during which I drove it back-to-back with the Focus ST, improved my opinion so much that I've had to update both this review and the one for the WRX. Great review, Michael thanks. My sister has a 2015 TSI SEL and loves it. Seemed very Audi like to me.. I look at TSI /TDI Golf dollars a little differently. Maybe a simplification, but it seems if you sell within the first four or five years, you get back the premium you paid for the TDI. So I see the purchase costs of the two as more or less equal. Taking your real world estiimates, with the Golf at 33 and the TDI at 42 MPG, the TDI mileage is 27% higher, so any time the price of diesel is less than 1.27 times the TDI saves money. AAA says nationwide regular is 2.828 a gallon x 1.27 = $3.59 . AAA price for diesel today? $3.59! So I figure on costs its a wash, at least today. But I'd much rather have the range and the torque of the TDI, so that would be my choice. Have you driven the new TDI, and if so, what was your impression of the solid rear axle on it, compared to the independent rear suspension in the GTI? I drove the TDI, but on fairly smooth roads, where no effect was noticeable. IRS will help most on bumpy roads, and even then the difference probably isn't large. After doing a head to head comparison of the 2013 GTI 2.OL turbo vs the regular GOLF 2.5L, we bought the regular Golf 2.5L. The suspension was smoother, especially on rough pavement and gravel. We also liked the seat comfort of the regular Golf better. The extra power of the turbo GTI only comes on at higher RPM,s, and the manual transmission gear ratios are too tall- not a good match for the engine. The turbo lag at low to mid-range rpm drove me crazy. On the other hand, the slight hesitation in the 2.5 can be cleared up by using premium fuel, and driving the automatic in Sport Mode or the manual sequential shift gate gets the best engine response. After a year of driving, we like our 2013 Golf a lot. The only negative I have is that the front passenger seat is not comfortable for a tall guy, but somehow the driver's seat is OK. Not sure why. Luckily, my wife lets me drive her car when we go more than a few blocks. That reminds me - is premium fuel indicated for any of the gasoline Golfs? Other question - do any VWs get auto-dimming side mirrors (or will any of the upcoming model years)? I have the 2012 TDI Golf and it's great but for this feature, and emissions and infotainment. Looking forward to seeing the 2017s. My understanding is the regular is fine for the 1.8 TSi, while premium is recommended but not required for the GTI. Using regular in the GTI will reduce performance and fuel economy. While the 2.5L VW runs OK on regular, there is an annoying hesitation on applying partial throttle. Using premium fuel reduces this hesitation noticeably. The Premium fuel does not give any noticeable increase in power or gas mileage.